Founded on the 10th April 1973 as a mobile combat force of the Tank and Amoured Corps and the Ministry of National Defence, the 215 Tank Brigade is tasked with training, combat readiness and combating missions; participating in the natural disaster prevention and control, search and rescue, and other extraordinary tasks. Over the past 45 years of foundation, fighting and development, under the direct leadership and direction of the Party Executive Committee (PEC) and the High Command (HC) of the Tank and Amoured Corps, and the support and care of the local authorities and people in their stationing areas, generations of officers and soldiers of the Brigade have always demonstrated their solidarity, activeness, creativeness; overcome all hardships, challenges, and accomplished all the assigned tasks to build a tradition of “Solidarity, activeness, creativeness, overcoming any hardships, victory in every deployment”. During the course of establishment, combating and development, the Brigade’s PEC has always attached importance to the enhancement of the leadership and combat capability of its party organizations; strictly maintained the mechanism and formality of Party’ activities, training, self-criticism and criticism. Its subordinate PECs, party cells, directly party secretaries have always upheld their sense of responsibility in preparing the draft leadership resolution, and discussed with the commanders of their units to ensure the comprehensive leadership with focuses; pointed out the causes and accountabilities of collectives and individuals and worked out measures for overcoming the weaknesses. In the party activities, collective intellectual, combat morale, self-criticism and criticism have always been promoted. The Brigade’s PEC requires its cadres, particularly the commanders, commissars and political commissars to seriously obey the Party’s resolutions and take up their mission deployment; clearly define their tasks and responsibilities; actively settle all work relations; maintain solidarity and unity in their leadership and command. Besides, it has also ordered its subordinate units to thoroughly review the implementation of the Resolution No. 51-NQ/TW dated 20 July 2005 of the Politburo (9th tenure), the Resolution No. 513-NQ/ĐUQSTW dated 17 November 2005 of the Central Military Party Committee (now the Central Military Commission) on “Continuing to perfect the leadership mechanism of the Party, implementing the commander – commissar regime in the Vietnam People’s Army”; review the Directive No. 10-CT/TW dated 30 March 2007 of the Party’s Secretariat on “Enhancing the quality of party cells’ activities”; review the Instruction No. 09-HD/BTCTW dated 2nd March 2012 of the Central Organizational Commission and the Instruction No. 497/HD-CT dated 18th December 2012 of the General Political Department on “Contents of the party cell’s activities”, etc. Thereby, the true situations have been evaluated, lessons have been drawn for the leadership and implementation of the resolutions of each party executive committee, party organization and party member; wrong perceptions and wrongdoings have been opportunely prevented in accordance with the Central Resolution 4 (12th tenure) on party building and rectification. As a result, a robust change in both perception and action of cadres, party members, especially leading cadres at all levels have been made, helping improve the effectiveness and efficacy in leading the implementation of the tasks. Fully aware of the role of the cadres and party members, the Brigade’s PEC has always paid attention to the management, building, training, and enhancement the quality of this staff, and regarded this as the decisive factor to the quality, and effectiveness of the task performance of the unit. 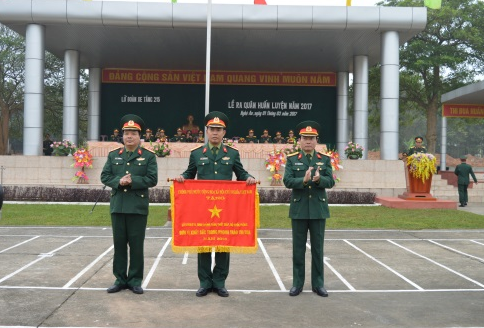 Being imbued with Ho Chi Minh’s teaching that: “Cadres are the basics of all tasks”, on the basis of resolutions, directives, instructions, and regulations of upper levels, the Brigade’s PEC has focused on leading, directing the building of a contingent of cadres with political steadfastness, moral virtue, strong leading and commanding capability, and successful accomplishment of the assigned tasks. To maintain the principles in the cadre work, the Brigade’s PEC has built its own Regulations for cadre work, and implemented it in a synchronous and unified manner, ensuring the principles of careful, democratic, transparent, and preventing the of individual, partial, emotional and arbitrary tendencies. The planning, sourcing, training, nurturing, evaluation, deployment and treatment of cadres have been done in accordance with regulations, processes and decided collectively. The evaluation of cadre’s quality and capability has been done in an equal and objective manner based on their task performance and credibility; cadre evaluation has been associated with party member’s quality analyses; the management, training and education of cadres and party members have been linked with the studying and following Ho Chi Minh’s thought, virtue and style, and the Drive of “Promoting tradition, devoting talents to be worthy of Uncle Ho’s soldiers’, etc. Moreover, the Brigade’s PEC has also paid due attention to the development of party members to ensure that 100% of its party cells have party executive boards, every platoon has party group and every crew has party member. With realistic measures, to date, 100% of the secretaries, vice-secretaries, party cells, commanding and key cadres at all levels of the Brigade have got fundamental training, and hold bachelor degrees. They have also become both red and expert, exemplary, and nuclei of solidarity in the leading, commanding and implementing of the tasks. The cadre contingent of the Brigade has seen steady growth in both quality and quantity with appropriate structure, meeting both short term and long term requirements. The Brigade’s PEC also attached importance to the Party’s inspection and discipline work. accordingly, party committees and party cells have regularly grasped, studied and seriously adhered to the resolutions, and Constitution of the Party, the resolutions, regulations, decisions, instruction of upper levels on the inspection and discipline work of the Party, especially the Decision No. 30-QD/TW dated 26 July 2016 of the Party Central Committee (12th tenure) and the Instruction No. 01-HD/UBKTTW implementing the Chapter VII and Chapter VIII of the Party’s Constitution on the inspection, supervision and discipline work of the Party. Attention has been paid to the discipline compliance of party members and party organizations and the implementation of the Circular No. 192/2016/TT-BQP dated 26 November 2016 of the Minister of National Defence on Discipline regulations in the Ministry of National Defence; the Regulation No. 47-QD/TW dated 01 November 2011 of the Party Central Committee (11th tenure) on the forbidden things for party members. Together with the regular and periodical inspection and supervision, party committees at all levels have also carried out inspection over the implementation of the Politburo’s Directive No. 05 (12th tenure) and the Central Resolution 4 (12th tenure) of their party organizations, party members and cadres. Consequently, the disciplining of cadres, party members and party organizations of the Brigade has seen positive changes; the party’s principles of organization, activities, and discipline have been adhered seriously; the intra solidarity and unity have been maintained; no sign of “self-evolution” and “self-transformation” has been reported. Annually, 95% of the Brigade’s party members are rated good and excellent; the Brigade have been ranked pure and strong for 10 years in a row, including 2 years of exceptionally pure and strong. The achievements of building its party pure and strong during 45 years of establishment, fighting and development are valuable lessons for the Brigade to inherit and promote in the new situation, contributing to build it an all strong unit and ceaselessly enhancing its overall quality, combat capability, and mission accomplishment to deserve its tradition of a Heoric People’s Armed Forces Heroic Unit.